For other people named Paul Allen, see Paul Allen (disambiguation). Paul Gardner Allen (January 21, 1953 – October 15, 2018) was an American business magnate, investor, researcher, humanitarian, and philanthropist. He co-founded Microsoft alongside Bill Gates in 1975, which helped spark the microcomputer revolution and later became the world's largest PC software company. In March 2018, Allen was estimated to be the 44th-wealthiest person in the world according to the Forbes annual list of the world's billionaires, with an estimated net worth of $21.7 billion, revised at the time of his death to $20.3 billion. Chairman and Founder Vulcan Inc.
Allen was the founder, with his sister Jody Allen, and Chairman of Vulcan Inc., the privately held company that managed his various business and philanthropic efforts. He had a multibillion-dollar investment portfolio including technology and media companies, scientific research, real estate holdings, private spaceflight ventures, and stakes in other sectors. He owned two professional sports teams: the Seattle Seahawks of the National Football League and the Portland Trail Blazers of the National Basketball Association, and was part-owner of the Seattle Sounders FC, which joined Major League Soccer in 2009. Allen was the founder of the Allen Institute for Brain Science, Institute for Artificial Intelligence, Institute for Cell Science, Stratolaunch Systems, and Apex Learning. He gave more than $2 billion to causes such as education, wildlife and environmental conservation, the arts, healthcare, community services, and more. He received numerous awards and honors in several different professions, and was listed among the Time 100 Most Influential People in the World in both 2007 and 2008. Allen was born on January 21, 1953, in Seattle, Washington, to Kenneth Sam Allen and Edna Faye (née Gardner) Allen. Allen attended Lakeside School, a private school in Seattle, where he befriended the two-years-younger Bill Gates, with whom he shared an enthusiasm for computers. They used Lakeside's Teletype terminal to develop their programming skills on several time-sharing computer systems. They also used the laboratory of the Computer Science Department of the University of Washington, doing personal research and computer programming; on at least one occasion in 1971 they were banned from the laboratory for abuse of their privileges there. According to Allen, in their teenage years he and Bill Gates would go dumpster-diving for computer program code. After graduating and obtaining a perfect SAT score of 1600, Allen went to Washington State University, where he joined Phi Kappa Theta fraternity. He dropped out after two years to work as a programmer for Honeywell in Boston, near Harvard University where Bill Gates had ended up. Allen later convinced Gates to drop out of Harvard in order to create Microsoft. In 1975, in Albuquerque, New Mexico, Allen and Gates began marketing a BASIC programming language interpreter. Allen came up with the original name of "Micro-Soft" (a combination of "microcomputer" and "software"), according to a 1995 Fortune magazine article. 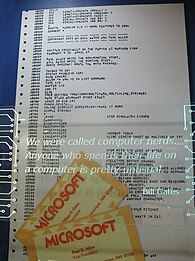 In 1980, after Microsoft had committed to deliver IBM a disk operating system (DOS) for the original IBM PC, although they had not yet developed one, Allen spearheaded a deal for Microsoft to purchase QDOS (Quick and Dirty Operating System), written by Tim Paterson, who, at the time, was employed at Seattle Computer Products. As a result of this transaction, Microsoft was able to secure a contract to supply the DOS that would eventually run on IBM's PC line. This contract with IBM proved the watershed in Microsoft history that led to Allen's and Gates' wealth and success. Allen effectively left Microsoft in 1982 after receiving a Hodgkin's lymphoma diagnosis. Gates reportedly asked Allen to give him some of his shares to compensate for the higher amount of work being performed by Gates. According to Allen, Gates said since he "did almost everything on BASIC", the company should be split 60–40 in his favor. Allen agreed to this arrangement, which Gates later renegotiated to 64–36. In 1983, Gates tried to buy Allen out at $5 per share but Allen refused and left the company with his shares intact. This made Allen a billionaire when Microsoft went public. Allen resigned from his position on the Microsoft board of directors on November 9, 2000. He remained as a senior strategy advisor to the company's executives. In January 2014, he still held 100 million shares of Microsoft. Vulcan Capital is an investment arm of Allen's Seattle-based Vulcan Inc., which has managed his personal fortune. In 2013, Allen opened a new Vulcan Capital office in Palo Alto, California, to focus on making new investments in emerging technology and internet companies. Patents: Allen held 43 patents from the United States Patent and Trademark Office. Apps: Allen backed A.R.O., the startup behind the mobile app Saga; SportStream, a social app for sports fans; and a content-management app called Fayve. Interval Research Corporation: In 1992, Allen and David Liddle co-founded Interval Research Corporation, a Silicon Valley-based laboratory and new business incubator that was dissolved in 2000 after generating over 300 patents, four of which were the subject of Allen's August 2010 patent infringement lawsuit against AOL, Apple, eBay, Facebook, Google, Netflix, Office Depot, OfficeMax, Staples, Yahoo!, and YouTube. Ticketmaster: In 1993, Allen invested $243 million to acquire 80% of Ticketmaster. In 1997, Home Shopping Network acquired 47.5% of Allen's stock in exchange for $209 million worth of their own stock. Charter Communications: In 1998, Allen bought a controlling interest in Charter Communications. Charter filed for bankruptcy reorganization in 2009, with Allen's loss estimated at $7 billion. Allen kept a small stake after Charter emerged from reorganization, worth $535 million in 2012. The company's 2016 purchase and subsequent merger of Time Warner Cable with Charter's subsidiary, Spectrum, made Charter Communications the second-largest cable company in the U.S.
Allen confirmed that he was the sole investor behind aerospace engineer and entrepreneur Burt Rutan's SpaceShipOne suborbital commercial spacecraft on October 4, 2004. The craft was developed and flown by Mojave Aerospace Ventures, which was a joint venture between Allen and Rutan's aviation company, Scaled Composites. SpaceShipOne climbed to an altitude of 377,591 feet (115,090 m) over the Mojave Air and Space Port and was the first privately funded effort to successfully put a civilian in suborbital space. It won the Ansari X Prize competition and received the $10 million prize. On December 13, 2011, Allen announced the creation of Stratolaunch Systems, based at the Mojave Air and Space Port. The Stratolaunch is a proposed orbital launch system consisting of a dual-bodied, 6-engine jet aircraft, capable of carrying a rocket to high altitude; the rocket would then separate from its carrier aircraft and fire its own engines to complete its climb into orbit. If successful, this project would be the first wholly privately funded space transport system. Stratolaunch, which is partnering with Orbital ATK and Scaled Composites, is intended to launch in inclement weather, fly without worrying about the availability of launch pads and to operate from different locations. Stratolaunch plans to ultimately host six to ten missions per year. On April 13, 2015, Vulcan Aerospace was announced. It is the company within Allen's Vulcan Inc. that plans and executes projects to shift how the world conceptualizes space travel through cost reduction and on-demand access. On April 13, 2019, the Stratolaunch aircraft made its maiden flight, reaching 15,000 ft (4,600 m) and 165 kn (305 km/h) in a 2 h 29 min flight. Stratolaunch CEO Jean Floyd offered this comment: "We dedicate this day to the man who inspired us all to strive for ways to empower the world's problem-solvers, Paul Allen. Without a doubt, he would have been exceptionally proud to see his aircraft take flight". (L-R) Marion Blakey, Mike Melvill, Sir Richard Branson, Burt Rutan, Brian Binnie and Paul G. Allen reflect on a mission accomplished in 2004. Allen (third from right) and Burt Rutan (fifth from right) were presented with the Ansari X PRIZE by members of the X PRIZE Foundation in 2004. SpaceShipOne can now be found at the Smithsonian Air and Space Museum. Allen's Vulcan Real Estate division offers development and portfolio management services, and is known for the redevelopment of the South Lake Union neighborhood immediately north of downtown Seattle. Vulcan has developed 6.3 million square feet (590,000 m2) of new residential, office, retail and biotechnology research space, and has a total development capacity of 10,000,000 sq ft (930,000 m2). Vulcan advocated for the Seattle Streetcar line known as South Lake Union Streetcar, which runs from Seattle's Westlake Center to the south end of Lake Union. In 2012, The Wall Street Journal called Allen's South Lake Union investment "unexpectedly lucrative" and one that led to his firm selling a 1,800,000-square-foot (170,000 m2) office complex to Amazon.com for US$1.16 billion, one of the most expensive office deals ever in Seattle. "It's exceeded my expectations", Allen said of the South Lake Union development. Sports and event centers: Allen funded the development of Portland's Moda Center, which he purchased in 2007. He also contributed $130 million to help build CenturyLink Field in Seattle. Seattle Cinerama: Allen purchased Seattle's historic Cinerama Theater in 1998, and upgraded it with 3-D capability and digital sound, in addition to interior and exterior refurbishing. The theater installed the world's first commercial digital laser projector in 2014. Hospital Club: Allen opened the Hospital Club in London in 2004 as a professional and social hub for people working in the creative arts. A second location in Los Angeles is under construction. Allen purchased the Portland Trail Blazers NBA team in 1988 from California real estate developer Larry Weinberg for $70 million. He was instrumental in the development and funding of the Moda Center (previously known as the Rose Garden), the arena where the Blazers play. He purchased the arena on April 2, 2007, and stated that this was a major milestone and a positive step for the franchise. The Allen-owned Trail Blazers reached the playoffs 19 times including the NBA Finals in 1990 and 1992. According to Forbes, the Blazers were valued at $940 million in 2015 and ranked No. 12 out of 30 NBA teams. Allen purchased the Seattle Seahawks NFL team in 1996 when former owner Ken Behring threatened to move the Seahawks to Southern California. Herman Sarkowsky, a former Seahawks minority owner, told The Seattle Times about Allen's decision to buy the team, "I'm not sure anybody else in this community would have done what [Allen] did." The Seahawks are valued at $1.33 billion in August 2014 by Forbes, which says the team has "one of the most rabid fan bases in the NFL". Under the helm of Allen, the Seahawks made the Super Bowl three times following NFC Championship victories (2005, 2013, 2014), and won Super Bowl XLVIII. Allen's Vulcan Sports & Entertainment is part of the ownership team of the Seattle Sounders FC, a Major League Soccer (MLS) franchise that began play in 2009 at CenturyLink Field, a stadium which was also controlled by Allen. The ownership team also includes film producer Joe Roth, businessman Adrian Hanauer, and comedian Drew Carey. The Sounders sold out every home game during its first season, setting a new MLS record for average match attendance. Allen and his sister Jody Allen together were the owners and executive producers of Vulcan Productions, a television and film production company headquartered in Seattle within the entertainment division of Vulcan Inc. Their films have received various recognition, ranging from a Peabody to Independent Spirit Awards, Grammys and Emmys. In 2014 alone, Allen's film, We The Economy, won 12 awards including a Webby award for best Online News & Politics Series. The films have also been nominated for Golden Globes and Academy Awards among many others. Vulcan Productions' films and documentary projects include Far from Heaven (2002), Hard Candy (2005), Rx for Survival: A Global Health Challenge (2005), Where God Left His Shoes (2006), Judgment Day: Intelligent Design on Trial (2007), This Emotional Life (2010), We The Economy (2014) Racing Extinction (2015) and Oscar-nominated Body Team 12 (2015). In 2013, Vulcan Productions co-produced the Richard E. Robbins-directed film Girl Rising which tells the stories of girls from different parts of the world who seek an education. Globally over 205 million households watched Girl Rising during the CNN and CNN International premieres, and over 4 million people have engaged with Girl Rising through websites and social media. Through the associated 10x10 program, over $2.1 million has been donated to help girls receive an education worldwide. Also in 2013, Vulcan Productions signed on as a producing partner of Pandora's Promise, a documentary about nuclear power, directed by Oscar-nominated director Robert Stone. It was released in select theaters nationwide June 12, 2013 and on CNN on November 7, 2013. A variety of college and private screenings as well as panel discussions have been hosted throughout the country. Allen gave more than $2 billion towards the advancement of science, technology, education, wildlife conservation, the arts, and community services in his lifetime. The Paul G. Allen Family Foundation, which he founded with Jody Allen, was established to administer a portion of Allen's philanthropic contributions. Since its formation, the foundation has given more than $494 million to over 1,500 nonprofits and in 2010, Allen became a signatory of The Giving Pledge, promising to give at least half of his fortune to philanthropic causes. Allen received commendations for his philanthropic commitments including the Andrew Carnegie Medal of Philanthropy and Inside Philanthropy's "Philanthropist of the Year". Allen (right) studies a brain sample with Allan Jones, CEO of the Allen Institute for Brain Science, in 2011. In September 2003, Allen launched the Allen Institute for Brain Science with a $100 million contribution dedicated to understanding how the human brain works. In total, Allen donated $500 million to the institute, making it his single largest philanthropic recipient. Since its launch, the Allen Institute for Brain Science has taken a Big Science and Open Science approach to tackle projects. The institute makes research tools available to the scientific community using an open data model. Some of the institute's most notable projects include the Allen Mouse Brain Atlas, Allen Human Brain Atlas and the Allen Mouse Brain Connectivity Atlas. The Allen Institute is also helping to advance and shape the White House's BRAIN Initiative as well as the Human Brain Project. Founded in 2014, the Allen Institute for Artificial Intelligence (AI2)'s main focus is to research and engineer artificial intelligence. The Institute is modeled after the Allen Institute for Brain Science and led by researcher and professor, Dr. Oren Etzioni. AI2 has undertaken four main projects, Aristo, Semantic Scholar, Euclid and Plato. Project Aristo is working to build an AI system capable of passing an 8th grade science exam. In December 2014, Allen committed $100 million to create the Allen Institute for Cell Science in Seattle. The institute is investigating and creating a virtual model of cells in the hope of bringing forth treatment of different diseases. Like the institutes before it, all data generated and tools developed will be made publicly available online. Launched in 2016 with a $100 million commitment, The Paul G. Allen Frontiers Group aims to discover and support ideas at the frontier of bioscience in an effort to accelerate the pace of discovery. The group is led by Tom Skalak and will be targeting scientists and research areas that "some might consider out-of-the-box at the very edges of knowledge". Allen launched the Allen Distinguished Investigators Awards (ADI) in 2010 to support scientists pursuing early-stage research projects who often have difficulty securing funding from traditional sources. Allen donated the seed money to build SETI's Allen Telescope Array, eventually contributing $30 million to the project. The Paul Allen's flower fly was named in recognition of his contributions to Dipterology. Allen provided more than $7 million to fund a census of elephant populations in Africa, the largest such endeavour since the 1970s. The Great Elephant Census team flew over 20 countries to survey African savannah elephants. The survey results were published in 2015 and showed rapid rates of decline which were accelerating. He began supporting the University of British Columbia's Sea Around Us Project in 2014 to improve data on global fisheries as a way to fight illegal fishing. Part of his $2.6 million in funding went towards the creation of FishBase, an online database about adult finfish. Allen funded the Global FinPrint initiative, launched in July 2015, a three-year survey of sharks and rays in coral reef areas. The survey is the largest of its kind and designed to provide data to help conservation programs. Allen backed Washington state initiative 1401 to prohibit the purchase, sale and distribution of products made from 10 endangered species including elephants, rhinos, lions, tigers, leopards, cheetahs, marine turtles, pangolins, sharks and rays. The initiative gained enough signatures to be on the state's ballot on November 3, 2015, and passed. Alongside the United States Department of Transportation (USDOT), Allen and Vulcan Inc. launched the Smart City Challenge, a contest inviting American cities to transform their transportation systems. Created in 2015 with the USDOT's $40 million commitment as well as $10 million from Allen's Vulcan Inc., the challenge aims to create a first-of-its-kind modern city that will demonstrate how cities can improve quality of life while lowering greenhouse gas emissions. The winning city was Columbus, Ohio. As a founding member of the International SeaKeepers Society, Allen hosted its proprietary SeaKeeper 1000TM oceanographic and atmospheric monitoring system on all three of his megayachts. Allen funded the building of microgrids, which are small-scale power grids that can operate independently, in Kenya to help promote reusable energy and empower its businesses and residents. He was an early investor in the Mawingu Networks, a wireless and solar-powered Internet provider which aims to connect rural Africa with the world, and Off Grid Electric, a company focused on providing solar energy to people in emerging nations. In 2014, Allen pledged at least $100 million toward the fight to end the Ebola virus epidemic in West Africa, making him the largest private donor in the Ebola crisis. He also created a website called TackleEbola.org as a way to spread awareness as well as serve as a way donors could fund projects in need. The site additionally highlighted organizations working to stop Ebola that Allen supported such as International Red Cross and Red Crescent Movement, Médecins Sans Frontières, Partners in Health, UNICEF and World Food Program USA. On April 21, 2015, Allen brought together key leaders in the Ebola fight at the Ebola Innovation Summit in San Francisco. The summit aimed to share key learnings and reinforce the need for continued action and support to bring the number of Ebola cases down to zero, which was achieved in January 2016. In October 2015, the Paul G. Allen Family Foundation announced it would award seven new grants totaling $11 million to prevent future widespread outbreaks of the virus. In 2012, along with his research team and the Royal Navy, Allen attempted to retrieve the bell from HMS Hood, which sank in the Denmark Strait during World War II, but the attempt failed due to poor weather. On August 7, 2015, they tried again and recovered the bell in very good condition. It was restored and put on display in May 2016 in the National Museum of the Royal Navy, Portsmouth, in remembrance of the 1,415 crewmen lost. Since 2015, Allen funded the research ship RV Petrel, which has explored several notable shipwrecks, including; the Japanese battleship Musashi in the Sibuyan Sea off the coast of Romblon, Philippines, and USS Juneau during an expedition to Guadalcanal. On 19 August 2017, a search team financed by Paul Allen located the wreckage of the USS Indianapolis (CL/CA-35) in the Philippine Sea lying at a depth of approximately 18,000 ft (5,500 m). On December 20, 2018, the crew of the Indianapolis was collectively awarded a Congressional Gold Medal. Museum of Pop Culture, or MoPOP, is a nonprofit museum, dedicated to contemporary popular culture inside a Frank Gehry-designed building at Seattle Center, established in 2000. Flying Heritage Collection, which showcases restored vintage military aircraft and armaments primarily from the World War II era, established in 2004. STARTUP Gallery, a permanent exhibit at the New Mexico Museum of Natural History and Science in Albuquerque dedicated to the history of the microcomputer, established in 2007. Living Computer: Museum + Labs, a collection of vintage computers in working order and available for interactive sessions on-site or through networked access, opened to the public in 2012. An active art collector, Allen gifted more than $100 million to support the arts. On October 15, 2012, the Americans for the Arts gave Allen the Eli and Edythe Broad Award for Philanthropy in the Arts. Allen also loaned out more than 300 pieces from his private art collection to 47 different venues. In 2013, Allen sold Barnett Newman's Onement VI (1953) at Sotheby's in New York for $43.8 million which at the time was the record price to have been paid for a work by the abstract artist. In 2015, Allen founded the Seattle Art Fair, a four-day event with 60-plus galleries from around the world including the participation of the Gagosian Gallery, David Zwirner, and many others. The event drew thousands and inspired other satellite fairs throughout the city. In August 2016, Allen announced the launch of Upstream Music Fest + Summit, an annual festival fashioned after South by Southwest. Held in Pioneer Square, the first festival took place in May 2017. 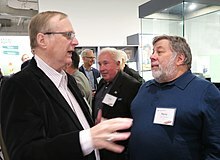 Allen and Steve Wozniak at the Living Computer Museum in 2017. In 1989, Allen donated $2 million to the University of Washington to construct the Allen Library, which was named after his father Kenneth S. Allen, a former associate director of the University of Washington library system. In the same year, Allen donated an additional $8 million to establish the Kenneth S. Allen Library Endowment. In 2012, the endowment was renamed the Kenneth S. and Faye G. Allen Library Endowment after Allen's mother (a noted bibliophile) died. In 2002, Allen donated $14 million to the University of Washington to construct the Paul G. Allen Center for Computer Science and Engineering. The building was dedicated in October 2003. In 2010, Allen announced a gift of $26 million to build the Paul G. Allen School of Global Animal Health at Washington State University, his alma mater. The gift was the largest private donation in the university's history. In 2016, Allen pledged a $10 million donation over four years for the creation of the Allen Discovery Centers at Tufts University and Stanford University. The centers would fund research that would read and write the morphogenetic code. Over eight years the donation could be as much as $20 million. In 2017, Allen donated $40 million (with an additional $10 million added by Microsoft) to reorganize the University of Washington's Computer Science and Engineering department into the Paul G. Allen School of Computer Science and Engineering. While Allen expressed interest in romantic love and one day having a family, he never married and had no children. His marriage plans, with his first girlfriend Rita, were cancelled as he felt he "was not ready to marry at 23". He was sometimes considered reclusive. Paul Allen and the Underthinkers perform at the Allen Institute for Brain Science's 10th-anniversary gala. Allen received his first electric guitar at the age of sixteen, and was inspired to play it by listening to Jimi Hendrix. In 2000, Allen played rhythm guitar on the independently-produced album Grown Men. In 2013, he had a major label release on Sony's Legacy Recordings; Everywhere at Once by Paul Allen and the Underthinkers. PopMatters.com described Everywhere at Once as "a quality release of blues-rock that's enjoyable from start to finish". On February 7, 2018, an interview with Quincy Jones was released by the magazine New York on their Vulture website. In this interview, Jones said that he had extreme respect for Eric Clapton, his band Cream, and Allen. Referencing Allen's Hendrix-like play, the article mentioned a jam session on a yacht with Stevie Wonder. Allen's 414-foot (126 m) yacht, Octopus, was launched in 2003. As of 2013, it was 14th on the list of motor yachts by length. The yacht is equipped with two helicopters, a submarine, an ROV, a swimming pool, a music studio and a basketball court. Allen loaned the vessel for a number of operations. Octopus was also used in the search for a missing American pilot and two officers whose plane disappeared off Palau and the study of a rare fish called a coelacanth among many others. Octopus is a member of AMVER, a voluntary group ship reporting system used worldwide by authorities to arrange assistance for those in distress at sea. The ship is also known for its annual celebrity-studded parties which Allen hosted at the Cannes film festival, where Allen and his band played for guests. These performances included musicians such as Usher and David A. Stewart. Allen also owned Tatoosh, which is one of the world's 100 largest yachts. In January 2016, it was reported that Tatoosh allegedly damaged coral in the Cayman Islands. In April 2016, the Department of Environment (DoE) and Allen's Vulcan Inc. successfully completed a restoration plan to help speed recovery and protect the future of coral in this area. In 2016, Allen purchased a platform supply vessel and christened it RV Petrel. The project team aboard Petrel was responsible for locating the Japanese battleship Musashi when they were still aboard Octopus. In 2017, on Allen's directions, RV Petrel found USS Indianapolis, USS Ward, the wrecks of the Battle of Surigao Strait and the Battle of Ormoc Bay. In 2018, Petrel found a lost US Navy C-2A Greyhound aircraft in the Philippine Sea, USS Lexington in the Coral Sea and more recently USS Juneau. Allen was diagnosed with Stage 1-A Hodgkin's lymphoma in 1982. Although his cancer was successfully treated by several months of radiation therapy, Allen was diagnosed with non-Hodgkin lymphoma in 2009. Likewise, the cancer was successfully treated until it returned in 2018, which ultimately caused his death by septic shock on October 15, 2018. He was 65 years old. Following his death, Allen's sister Jody Allen was named executor and trustee of all of Paul Allen's estate, pursuant to his instructions, giving her responsibility for overseeing the execution of his will and settling his affairs with tax authorities and parties with an interest in his projects. Several Seattle-area landmarks, including the Space Needle, Columbia Center and CenturyLink Field, as well as various Microsoft offices throughout the United States, were illuminated in blue on November 3, 2018, as a tribute to Allen. On March 9, 2005, Allen, Burt Rutan, and the SpaceShipOne team were awarded the 2005 National Air and Space Museum Trophy for Current Achievement. In 2007 and 2008, Allen was listed among the Time 100 Most Influential People in The World. He received the Vanguard Award from the National Cable & Telecommunications Association on May 20, 2008. On October 30, 2008, the Seattle-King County Association of Realtors honored Allen for his "unwavering commitment to nonprofit organizations in the Pacific Northwest and lifetime giving approaching US$1 billion". In 2009, Allen's philanthropy as the long-time owner of the Portland Trail Blazers was recognized with an Oregon Sports Award. On October 26, 2010, Allen was awarded the W. J. S. Krieg Lifetime Achievement Award for his contributions to the field of neuroscience by the Cajal Club. On January 26, 2011, at Seattle's Benaroya Hall, Allen was named Seattle Sports Commission Sports Citizen of the Year, an award that has been renamed the Paul Allen Award. In 2011, Allen was elected to the American Academy of Arts and Sciences. On October 15, 2012, Allen received the Eli and Edythe Broad Award for Philanthropy in the Arts at the National Arts Awards. On February 2, 2014, Allen received a Super Bowl ring as the Seattle Seahawks won the Vince Lombardi Trophy. On October 22, 2014, Allen received a Lifetime Achievement Award from Seattle Business magazine for his impact in and around the greater Puget Sound region. On December 31, 2014, online philanthropy magazine Inside Philanthropy made Allen their inaugural "Philanthropist of the Year" for his ongoing effort to stop the Ebola outbreak in West Africa, breaking ground on a new research center in Seattle, and his battle to save the world's oceans. In 2014, Allen was inducted into the International Space Hall of Fame. On July 18, 2015, Ischia Global Film and Music Festival recognized Allen with the Ischia Humanitarian Award. Event organizers honored Allen for his contributions to social issues through his philanthropic efforts. On August 25, 2015, Allen was named a recipient of the Andrew Carnegie Medal of Philanthropy for his work to "save endangered species, fight Ebola, research the human brain, support the arts, protect the oceans, and expand educational opportunities for girls". On October 3, 2015, the Center for Infectious Disease Research presented Allen with the 2015 "Champion for Global Health Award" for his leadership and effort to fight Ebola. On December 10, 2016, Allen, as co-owner of the Seattle Sounders, won the 2016 MLS Cup. Honorary degree from the Washington State University. The university bestowed its highest honor, the Regents' Distinguished Alumnus Award, upon him. Honorary doctorate in Philosophy from Nelson Mandela Metropolitan University. Honorary doctorate of Science from the Cold Spring Harbor Laboratory's Watson School of Biological Sciences. Honorary degree from the École Polytechnique Fédérale de Lausanne. In 2011, Allen's memoir Idea Man: A Memoir by the Cofounder of Microsoft, was published by Portfolio, a Penguin Group imprint. The book recounts how Allen became enamored with computers at an early age, conceived the idea for Microsoft, recruited his friend Bill Gates to join him, and launched what would become the world's most successful software company. It also explores Allen's business and creative ventures following his 1983 departure from Microsoft, including his involvement in SpaceShipOne, his purchase of the Portland Trailblazers and Seattle Seahawks, his passion for music, and his ongoing support for scientific research. The book made The New York Times Best Seller list. The paperback version of Idea Man, which included a new epilogue, came out on October 30, 2012. Pirates of Silicon Valley, a 1999 film about the rise of the personal computer. Allen is portrayed by Josh Hopkins. Black Sky: The Race For Space, a 2005 Discovery Channel documentary about Allen, SpaceShipOne and the Ansari X Prize. ^ "Paul Allen". Forbes. Retrieved July 31, 2015. ^ "The World's Biggest Public Companies". Forbes. Retrieved October 17, 2018. 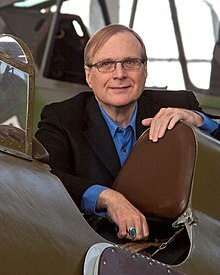 ^ "#44 Paul Allen - 2018 Billionaires Net Worth". Forbes. Retrieved October 12, 2018. ^ "#21 Paul Allen - 2018 Forbes 400 Net Worth". Retrieved October 12, 2018. ^ "Microsoft co-founder Paul Allen dies of cancer at age 65". CNBC. Retrieved October 16, 2018. ^ "Leadership". Vulcan.com. Retrieved July 6, 2016. ^ a b Attner, Paul (March 25, 1996). "Behring straits – Seattle Seahawks owner Ken Behring". Sporting News. Retrieved March 31, 2008. ^ a b "Learn More About Larry Weinberg". NBA.com. National Basketball Association. Archived from the original on March 6, 2008. Retrieved March 31, 2008. ^ a b "Seattle to Get Expansion MLS Franchise for 2009". ESPN. November 9, 2007. Retrieved November 10, 2007. ^ Timmerman, Luke (March 21, 2012). "Paul Allen Commits $300M to Expand Institute for Brain Science". Xconomy. ^ "Paul Allen Hires AI Luminary, Oren Etzioni, to Head New Artificial Intelligence Institute". Singularity Hub. Retrieved August 4, 2014. ^ "Allen Institute for Cell Science". Allen Institute for Cell Science. Retrieved April 18, 2015. ^ "Stratolaunch - Who We Are". Retrieved October 16, 2018. ^ "Education Growth Partners Acquires Paul Allen's Online Curriculum Company, Apex Learning - EdSurge News". EdSurge. May 2, 2017. Retrieved October 22, 2018. ^ a b "Expanded Bio". Paul Allen. Archived from the original on July 22, 2015. Retrieved July 31, 2015. ^ a b Pinker, Steven (May 3, 2007). "Paul Allen". TIME. Archived from the original on March 20, 2008. Retrieved March 31, 2008. ^ "Kenneth S. and Faye G. Allen Library Endowment – UW Libraries". Lib.washington.edu. Retrieved August 4, 2014. ^ a b c d e f Paul Allen (May 2011). "Microsoft's Odd Couple". Vanity Fair. Retrieved August 4, 2014. ^ Hannelore Sudermann, "Paul Allen, Welcome Back", Columns (University of Washington alumni magazine), June 2017, p. 16. ^ Allen, Paul (2012). Idea Man: A Memoir by the Cofounder of Microsoft. p. 40: Portfolio/Penguin. p. 40. ISBN 978-1-101-47645-1. ^ "Alumni Bookshelf – Phi Kappa Theta Fraternity, Incorporated". Phikaps.org. Retrieved August 4, 2014. ^ a b Allen, Paul (2012). Idea Man: A Memoir by the Cofounder of Microsoft. Penguin Publishing Group. p. 91. ISBN 978-1-101-47645-1. ^ Allen, Paul (2012). Idea Man: A Memoir by the Cofounder of Microsoft. Penguin Publishing Group. p. 131. ISBN 978-1-101-47645-1. ^ a b c "Paul Allen: Gates, Ballmer tried to 'rip me off'". CNET. March 30, 2011. ^ Allen, Paul (2012). Idea Man: A Memoir by the Cofounder of Microsoft. Penguin Publishing Group. pp. , 164–169. ISBN 978-1-101-47645-1. ^ Peter Robison and Brendan Coffey (January 30, 2014). "Seahawks beat Microsoft as investment for billionaire Paul Allen". The Seattle Times. ^ "Microsoft co-founder to open investment office in Silicon Valley". Reuters. April 1, 2013. ^ "USPTO Patent Full-Text and Image Database". Patft.uspto.gov. Retrieved July 31, 2015. ^ Perez, Sarah (June 16, 2012). "A.R.O. Reveals Saga, An "Ambient Companion" That Watches What You Do To Make Personal Recommendations". TechCrunch. Retrieved October 28, 2013. ^ Laird, Sam (June 14, 2012). "Why Did Paul Allen Bet $3.5 Million on SportStream?". Mashable. Retrieved October 28, 2013. ^ Bishop, Todd (November 7, 2012). "Paul Allen's personal media browsing tool is now an iPad app for the rest of us". GeekWire. Retrieved October 28, 2013. ^ "WTO Board Bio: David Liddle". Archived from the original on March 11, 2007. ^ "Allen sues Google, Apple, others over patents". Reuters. August 27, 2010. ^ Dionne Searcey (August 28, 2010). "Microsoft Co-Founder Launches Patent War". The Wall Street Journal. Retrieved August 29, 2010. ^ Budnick, Dean; Baron, Josh (2011). Ticket Masters: the rise of the concert industry and how the public got scalped. Toronto: ECW Press. pp. 227–229, 232. ISBN 978-1-55022-949-3. ^ "History of Charter Communications, Inc. – FundingUniverse". www.fundinguniverse.com. Retrieved November 23, 2017. ^ "Paul Allen, Charter and what might have been | Jon Talton". The Seattle Times. May 27, 2015. Retrieved February 6, 2018. ^ "Charter completes purchase of Time Warner Cable, Bright House". Los Angeles Times. May 18, 2016. ISSN 0458-3035. Retrieved November 23, 2017. ^ "Vulcan Underwrites SpaceShipOne". Archived from the original on March 31, 2012. Retrieved April 4, 2012. ^ Ina Fried (October 4, 2004). "SpaceShipOne captures X Prize". CNN. Archived from the original on March 21, 2008. Retrieved March 31, 2008. ^ Andy Pasztor and Dionne Searcey (December 14, 2011). "Paul Allen, Supersizing Space Flight". WSJ. Retrieved December 13, 2011. ^ Gugliotta, Guy (July 29, 2013). "With the shuttle done, a co-founder of Microsoft sees an opening in space". The Washington Post. Retrieved October 28, 2013. ^ "Aerospace". Vulcan. Retrieved July 31, 2015. ^ "The World's Largest Plane's First Flight From Every Angle". Popular Mechanics. April 15, 2019. Retrieved April 15, 2019. The tests come after a long series of taxi tests that always stopped just short of acheiving actual flight, but now that threshold has been crossed, and the engineers seem pleased with the results. ^ "STRATOLAUNCH, THE WORLD'S BIGGEST AIRPLANE, TAKES FLIGHT". Condé Nast Wired. April 13, 2019. Retrieved April 15, 2019. the company hopes to use the twin-fuselage, six-engined, catamaran-style aircraft to launch satellite-bearing rockets into space. ^ ifthen.com. "Vulcan Real Estate". vulcanrealestate.com. Retrieved July 5, 2018. ^ Nick Timiraos (June 9, 2014). "A Look at Six U.S. Cities Pioneering New Economic Zones". The Wall Street Journal. ^ Mike Lindblom (September 22, 2012). "Amazon plan adds more streetcar trips". The Seattle Times. ^ Jeanne Lang Jones (October 5, 2012). "UPDATED: Amazon paying $1.16B for its 11-building Seattle campus". Puget Sound Business Journal. ^ Brown, Eliot (November 14, 2012). "Microsoft Co-Founder Succeeds in Seattle". The Wall Street Journal. ^ "History - Cinerama - Seattle's Most Epic Movie Experience". cinerama.com. ^ Vincent, Roger. "Microsoft co-founder Paul Allen bringing hip London club to Hollywood and Vine - Los Angeles Times". latimes.com. ^ "h.Club LA Takes Shape at Hollywood & Vine". Urbanize LA. March 22, 2018. ^ Wertheim, L. Jon (November 27, 2007). "The Quiet Owner: Paul Allen". Sports Illustrated. Archived from the original on December 1, 2007. Retrieved March 30, 2008. ^ "Portland Trail Blazers Franchise Index". Basketball-Reference.com. Retrieved July 31, 2015. ^ "#12 Portland Trail Blazers – In Photos: NBA Team Values 2015". Forbes. January 1, 1970. Retrieved July 31, 2015. ^ Jenks, Jayson. "How the Seahawks were saved from California's clutches". The Seattle Times. Retrieved October 28, 2013. ^ "Seattle Seahawks". Forbes. August 2014. ^ Branch, John, "After Doing It Their Way, Seahawks Savor the Moment", The New York Times, February 3, 2014. Retrieved February 3, 2014. ^ Romero, José Miguel (November 4, 2009). "Sounders success story, by the numbers". The Seattle Times. Archived from the original on November 8, 2009. Retrieved November 10, 2009. ^ "Vulcan Productions Homepage". Vulcanproductions.com. Retrieved July 31, 2015. ^ "Vulcan Productions Wins First Peabody Award; Produced with Discovery Channel, 'Black Sky: The Race for Space' Chronicles Successful X-Prize Attempt and the Allen/Rutan Partnership". Business Wire. April 12, 2005. Retrieved August 4, 2014. ^ a b c "Project". Vulcan Productions. Archived from the original on July 15, 2014. Retrieved August 4, 2014. ^ a b "Project". Vulcan Productions. Archived from the original on July 15, 2014. Retrieved August 4, 2014. ^ "Far from Heaven (2002)". IMDb.com. Retrieved July 31, 2015. ^ "Rx for Survival: A Global Health Challenge". Vulcanproductions.com. April 12, 2006. Archived from the original on July 15, 2014. Retrieved August 4, 2014. ^ "Hard Candy (2005)". IMDb.com. Retrieved July 31, 2015. ^ "Bickford Shmeckler's Cool Ideas (2006)". IMDb.com. Retrieved July 31, 2015. ^ "Judgment Day: Intelligent Design on Trial". Vulcanproductions.com. November 13, 2007. Archived from the original on July 15, 2014. Retrieved August 4, 2014. ^ "Project". Vulcan Productions. November 13, 2007. Archived from the original on July 15, 2014. Retrieved August 4, 2014. ^ "Project". Vulcanproductions.com. Archived from the original on July 25, 2015. Retrieved July 31, 2015. ^ "Project". Vulcan Productions. Archived from the original on July 15, 2014. Retrieved August 4, 2014. ^ "WE THE ECONOMY 20 Short Films You Can't Afford To Miss". Wetheeconomy.com. Retrieved July 31, 2015. ^ "Body Team 12". IMDb.com. Retrieved July 31, 2015. ^ "Girl Rising (2013)". IMDb.com. Retrieved July 31, 2015. ^ "Girl Rising". Girl Rising. Archived from the original on October 29, 2013. Retrieved August 4, 2014. ^ "Project". Vulcan Productions. June 12, 2013. Archived from the original on July 1, 2014. Retrieved August 4, 2014. ^ "Giving History – PGA Foundations". Pgafamilyfoundation.org. Archived from the original on July 22, 2015. Retrieved July 31, 2015. ^ "Microsoft co-founder Paul Allen to give half of his fortune to charity". ^ "Carnegie Medal of Philanthropy". Carnegie Medal of Philanthropy. Retrieved November 11, 2015. ^ a b "Philanthropy Awards, 2014 – Inside Philanthropy: Fundraising Intelligence". Inside Philanthropy. December 31, 2014. Retrieved July 31, 2015. ^ Herper, Matthew. "Billionaire Paul Allen Pours $500 Million into Quest To Find The Essence of Humanity in the Brain". Forbes. ^ "Global Impact – Allen Institute for Brain Science". alleninstitute.org. Archived from the original on April 1, 2014. Retrieved November 11, 2015. ^ "AI2 : Our Vision". allenai.org. Retrieved November 11, 2015. ^ Molly Brown. "Is your AI as smart as an 8th grader? Prove it to Paul Allen's AI2 for a shot to win $50K – GeekWire". GeekWire. Retrieved November 11, 2015. ^ "100 million create cell science institute". Paul Allen. December 8, 2014. Archived from the original on July 17, 2015. Retrieved July 31, 2015. ^ "Paul Allen donates $100 million to create cell science institute in Seattle". Puget Sound Business Journal. December 8, 2014. Retrieved November 11, 2015. ^ Buhr, Sarah. "Microsoft co-founder Paul Allen pledges $100 million toward cutting-edge biotech research". Tech Crunch. Retrieved March 28, 2016. ^ Boyle, Alan. "Paul Allen launches $100M Frontiers Group program for 'out-of-the-box' bioscience research". GeekWire. Retrieved March 28, 2016. ^ Doughton, Sandi (February 28, 2013). "Paul Allen gives $7.5 million to young scientists with big ideas". Seattle Times. Retrieved April 6, 2017. ^ "UC Berkeley passes management of Allen Telescope Array to SRI". ^ "Paul Allen's Flower Fly". Archived from the original on February 28, 2008. ^ "Great Elephant Census". Great Elephant Census. Retrieved November 11, 2015. ^ "Paul Allen's Conservation Giving is Going After Data, Now on Sharks – Inside Philanthropy: Fundraising Intelligence – Inside Philanthropy". insidephilanthropy.com. Retrieved November 11, 2015. ^ Kimberly Truong (July 9, 2015). "Microsoft's Paul Allen launches major conservation project during 'shark week'". Mashable. Retrieved November 11, 2015. ^ "Smart City Challenge". Transportation.gov. Retrieved February 16, 2016. ^ Davies, Alex. "The $50 Million Competition to Remake the American City". Wired. Retrieved December 7, 2015. ^ Donovan, Jay (June 23, 2016). "Columbus, Ohio officially winner of DOT Smart City Challenge and $140 million in innovation grants". techcrunch. Retrieved May 13, 2016. ^ "Superyacht owners secret weapon in fight against global warming". CNN. January 27, 2010. ^ Vulcan Inc. "Investing in a Vibrant Africa". Medium. Retrieved November 11, 2015. ^ "Off Grid Electric gets $7M to 'light Africa in a decade' (exclusive) – VentureBeat – Deals – by Christina Farr". VentureBeat. Retrieved November 11, 2015. ^ Stephanie Strom (October 23, 2014). "Paul Allen to Give $100 Million to Tackle Ebola Crisis". The New York Times. ^ "Home". Tackle Ebola. Retrieved July 31, 2015. ^ Hanley, Blair (April 21, 2015). "Lessons from the world's Ebola response: faster intervention, better communication needed". GeekWire. Retrieved July 31, 2015. ^ "Paul G. Allen Ebola Program Awards $11 Million to Prevent Epidemics". Philanthropy News Digest. Retrieved November 4, 2015. ^ Farmer, Ben (August 9, 2015). "HMS Hood's bell recovered from seabed by Microsoft co-founder". The Telegraph. Retrieved April 6, 2017. ^ "HMS Hood's bell unveiled at Navy museum Portsmouth". BBC News. May 24, 2016. Retrieved April 6, 2017. ^ Patricia Denise Chiu (March 3, 2015). "Explorers find 'most famous' Japanese WWII battleship off Romblon's Sibuyan Island". GMA News. ^ Crowley, Walt (March 15, 2003). "the Free Online Encyclopedia of Washington State History". HistoryLink.org. Retrieved August 4, 2014. ^ "Paul Allen's Flying Heritage Collection Announces Move to Paine Field". Archived from the original on October 23, 2013. ^ "New Mexico Museum of Natural History and Science, Albuquerque, New Mexico". ^ Gordon Blankinship, Donna (November 1, 2012). "Paul Allen's new Seattle computer museum not just for geeks". Seattle Times. Retrieved April 6, 2017. ^ "LCM – Home". Livingcomputermuseum.org. Retrieved August 4, 2014. ^ "Microsoft co-founder Paul Allen-the world's first masterpiece-collecting, Jimi Hendrix-worshiping philanthropist". Archived from the original on October 23, 2013. Retrieved October 22, 2013. ^ "A Celebration of National Leadership in the Arts". ^ Carol Vogel (April 24, 2014), A Barnett Newman For Sale The New York Times. ^ "The Seattle Art Fair Was So Successful, the City Literally Applauded". The Stranger. Retrieved November 11, 2015. ^ "Paul Allen's new festival, Upstream, to mentor and celebrate Seattle musicians". August 10, 2016. Retrieved August 12, 2016. ^ "University of Washington, Allen Library, Seattle, WA". Digital.washington.edu. Retrieved July 31, 2015. ^ "Kenneth S. and Faye G. Allen Library Endowment". ^ "Faye G. Allen, 1922–2012". Washington.edu. Retrieved July 31, 2015. ^ "Allen gives $14 million to new UW center". Seattle Post-Intelligencer. February 19, 2002. ^ "The Paul G. Allen Center for Computer Science & Engineering". Cs.washington.edu. Retrieved July 31, 2015. ^ Heim, Kristi (December 2, 2010). "Millions from Allen boost WSU research on animal diseases". Seattle Times. Retrieved April 6, 2017. ^ Langston, Jennifer. "$50M endowment establishes the Paul G. Allen School of Computer Science & Engineering at the University of Washington". UW News. Retrieved October 15, 2018. ^ Roose, Kevin (April 18, 2011). "Microsoft Co-founder Paul Allen Is Looking for Love (and Aliens, But Mostly Love)". New York. Retrieved November 11, 2018. ^ Shanley, Patrick; Jarvey, Natalie (October 15, 2018). "Paul Allen, Co-Founder of Microsoft, Dies at 65". The Hollywood Reporter. Retrieved November 11, 2018. ^ Lamm, Greg. "There's a bit of Howard Hughes in Paul Allen's space dream". Puget Sound Business Journal. ^ "60 Minutes compares Paul Allen's reclusive lifestyle to Howard Hughes". 60 Minutes. ^ Allen, Paul (2011). Idea Man: A Memoir by the Cofounder of Microsoft. New York: Portfolio/Penguin. p. 250. ISBN 978-1-59184-382-5. ^ "The Spokesman-Review". News.google.com. April 17, 2000. Retrieved July 31, 2015. ^ "Paul Allen: Plugged-in mogul". Music.msn.com. Retrieved July 31, 2015. ^ "Paul Allen and the Underthinkers: Everywhere at Once". August 5, 2013. ^ "10 Things You Didn't Know About Microsoft Billionaire Paul Allen, Seattle Seahawks Owner". Forbes. Retrieved August 4, 2014. ^ Marchese, David. "Quincy Jones on the Secret Michael Jackson and the Problem With Modern Pop". Vulture. Retrieved February 8, 2018. ^ Byrne, Diane M. "World's 100 Largest Yachts 2007". Power & Motoryacht. Retrieved March 31, 2008. ^ Byrne, Diane M. "America's 100 Largest Yachts". Power & Motoryacht. Archived from the original on March 8, 2008. Retrieved March 31, 2008. ^ "Paul Allen's yacht used in search for missing U.S. pilot". April 4, 2012. ^ "Blazers Owner Paul Allen Loans Custom Submarine To Amazing Fish Research – Blazer's Edge". Blazersedge.com. Retrieved August 4, 2014. ^ "Billionaire Paul Allen's yacht Octopus to the rescue – again!". Amver. November 27, 2012. ^ "Paul Allen Cannes yacht party – Business Insider". Business Insider. May 19, 2015. Retrieved November 11, 2015. ^ mirror Administrator (July 21, 2012). "Paul Allen superyacht: Microsoft founder's the 413ft-long Octopus in London for the Olympics – Mirror Online". mirror. Retrieved November 11, 2015. ^ Howard, Brian Clark. "Billionaire Conservationist's Yacht Damages Coral Reef". National Geographic. Retrieved April 14, 2016. ^ "Allen and DoE complete joint coral restoration plan". Cayman News Service. Cayman News Service. Retrieved April 14, 2016. ^ "VIDEO: Billionaire Paul Allen Finds Lost World War II Carrier USS Lexington - USNI News". USNI News. March 5, 2018. Retrieved March 5, 2018. ^ "Paul Allen Finds Sullivan Brothers' Cruiser USS Juneau - USNI News". USNI News. March 19, 2018. Retrieved March 19, 2018. ^ Henderson, Brady (October 1, 2018). "Paul Allen says non-Hodgkin lymphoma has returned". ESPN. Retrieved October 2, 2018. ^ Faulkner, Trisha (October 20, 2018). "Paul Allen's Cause Of Death Revealed: Septic Shock & Immunosuppression". Inquisitr. Retrieved October 20, 2018 – via (see: septic shock, immunosuppression). ^ "Microsoft co-founder Paul Allen dies at 65". Retrieved October 15, 2018. ^ "Microsoft co-founder Paul Allen dies at 65". ^ Wang, Christine (October 15, 2018). "Microsoft co-founder Paul Allen dies of cancer at age 65". CNBC. Retrieved October 15, 2018. ^ "Paul Allen's sister Jody named executor, trustee of late billionaire's estate". The Seattle Times. October 24, 2018. ^ Martin, Genna (November 4, 2018). "Seattle is bathed in blue in honor of Paul Allen". Seattle Post-Intelligencer. Retrieved November 4, 2018. ^ "National Air and Space Museum to Acquire SpaceShipOne, First Successful Privately Built Spacecraft". Airandspace.si.edu. Retrieved July 31, 2015. ^ "Anne Sweeney, Matt Blank Top Vanguard Award Winners". ^ Stroupe, James (May 22, 2008). "70th Annual First Citizen Award Honoring Paul Allen". stroupecondoblog.com. Archived from the original on March 28, 2012. Retrieved July 28, 2011. ^ Alexander, Steven (February 3, 2010). "From Paul Allen to preps, Oregon Sports Awards finalists stood out in 2009". ^ "Paul G. Allen receives Krieg Lifetime Achievement Award for contributions in neuroscience". ^ "Seattle Seahawks Owner Paul Allen is Sports Citizen of the Year". Archived from the original on July 21, 2011. Retrieved April 27, 2011. ^ "Ed Felton elected to American Academy of Arts & Sciences". ^ "A Celebration of National Leadership in the Arts". Archived from the original on October 29, 2013. ^ "Official Site of the National Football League". NFL.com. Retrieved August 4, 2014. ^ Nick Horton (November 2014). "The 2014 Community Impact Awards: Lifetime Achievement". Seattle Business. ^ "Paul Gardner Allen". International Space Hall of Fame. Retrieved January 20, 2019. ^ "Awarded Ischia Award". Paul Allen. July 20, 2015. Archived from the original on July 22, 2015. Retrieved July 31, 2015. ^ "Medalists". Carnegie Medal of Philanthropy. Retrieved November 11, 2015. ^ "Paul G. Allen to Receive the Center for Infectious Disease Research's "Champion for Global Health Award" – Center for Infectious Disease Research". cidresearch.org. Retrieved November 11, 2015. ^ "Regents Select Paul Allen for Distinguished Alumnus Award – WSU News Washington State University". News.wsu.edu. January 22, 1999. Retrieved July 31, 2015. ^ "SA's first deputy president among NMMU honorary doctorate recipients". Nelson Mandela Metropolitan University. March 31, 2014. Archived from the original on January 1, 2016. ^ "Oliver Sacks, Eric Kandel and Paul G. Allen to Receive Honorary Degrees at Watson School of Biological Sciences' Commencement". Cold Spring Harbor Laboratory. Archived from the original on January 29, 2015. Retrieved January 28, 2015. ^ Bishop, Todd. "Microsoft founders Allen, Gates reconnect after year-long rift". GeekWire. Retrieved December 10, 2012. "Paul Allen collected news and commentary". The New York Times.